Do you have a skill or talent that would be useful to WSC? Or maybe you are looking to get more involved in the community. Perhaps you need volunteer hours to fulfill a career objective. No matter the reason, WSC wants you! We have something for everyone to be apart of. Our volunteers are exceptional people who help make WSC a better more efficient organization. We appreciate all our volunteers for their efforts each and every day. So thank you in advance and lets get started! For more information email volunteer@womenscyberjutsu.org. Non-profits are run by 85% of volunteers across the country. WSC is no exception. As a growing community of professional women, more help is needed to uphold our mission and bridge the gender divide in cybersecurity. With the help of our volunteers, new ideas and inputs are born. This is why we need you! Some companies offer volunteer matching for their employees. Meaning, your company could donate funds to WSC just because you volunteer with us!!! For more information on the volunteer matching, check out these sites. Be sure to contact your HR department and see as well! Like working with kids? Want to learn something new? Volunteer with Cyberjutsu Girls Academy. 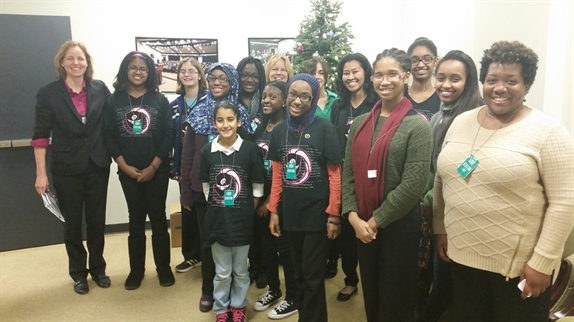 Our STEM-based hands-on learning academy for middle school-aged girls.